Chilli rating - hot - 3. Juicy, hot, pickled jalapeños. 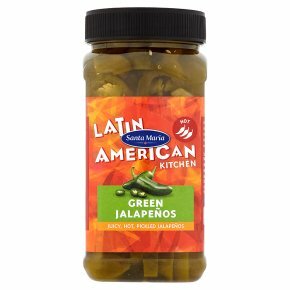 Suitable for vegetarians.Green jalapeños are picked earlier in the ripening process compared to the red. Our green jalapeños are pickled and bring heat and a fresh, crisp, vegetal flavour to any dish.